An integral piece of the Thirty Meter Telescope’s Multi Segment Integration and Test facility (MSIT) has just been delivered to California. After leaving the port of Osaka, Japan on March 25, 2017, the Primary Mirror Cell prototype (MCP) arrived at the end of April 2017 and is now undergoing minor modifications prior to its final delivery to the Thirty Meter Telescope (TMT) laboratory in Monrovia. The TMT Primary Mirror System is comprised of 492 active mirror segments; the MSIT will enable integrated testing of up to seven primary mirror segments. The National Astronomical Observatory of Japan (NAOJ) has contracted with Mitsubishi Electric Company (MELCO) for the design of the Telescope Structure System. Hitachi Zosen Corporation, a major Japanese industrial and engineering corporation, is working with MELCO on its fabrication. Hitachi Zosen built the MCP for MELCO to determine if they can achieve the required dimensional accuracy and validate the proposed welding plan. In December 2016, TMT staff went to Osaka to perform an inspection of the MCP. Hitachi Zosen also designed and built a special container to transport the steel structure as well as a special frame to stabilize the MCP during its long journey to California. The MSIT will be used to verify form, fit and function of all TMT Primary Mirror System components and assemblies prior to full-scale production. In addition, the MSIT will verify the operation and performance of the M1 Control System (M1CS). The M1CS is responsible for turning the 492 TMT mirrors segments into the equivalent of a 30-meter diameter monolithic mirror. The M1CS must measure and control with nanometer precision to be successful. In addition, the MSIT has the ability to tilt the MCP – with seven segments installed – to 15 degrees, which is the tilt of the primary mirror at its perimeter when the telescope is pointing to the zenith. This allows the development team to work through the ergonomic challenges of working at the perimeter of the mirror cell. The MSIT will include seven full-size - 1.44m - aluminum segments (one central segment surrounded by the six others). The aluminum segments will be machined in the U.S. in the next several weeks. The aluminum segments may be replaced with actual TMT glass segments at a future date. Each segment will be mounted on a Segment Support Assembly (SSA) that supports the segment in translation and rotation while maintaining the optimal shape of its optical surface. Six of the seven SSAs were built in India under the direction of the India TMT Coordination Center. (ITCC). Twenty-one actuators (three for each segment) and twenty-four edge-sensors, both with nanometer precision, are used to control the height and tilts of the individual seven segments so as to make an equivalent monolithic mirror. Dust boots encase the sensors to keep them clean while a purge system maintains the humidity within the boot to an acceptable level. The actuators and sensors for the MSIT are fabricated in India under the direction of ITCC. Precision electronics for control and readout of the edge sensors and actuators are being designed by the Jet Propulsion Laboratory (JPL) in Pasadena. The electronics are distributed on the Segments, SSAs, and in “Node Wells” beneath the MCP floor. Although the electronics for the MSIT are initially being fabricated in the United States, the production electronics will be built in India also under the direction of ITCC. A Segment Lifting Jack System will be used to support segment installation and removal from the MSIT. The software that will control the MSIT is a small scale version of the Global Loop Controller (GLC), which controls the 492 TMT segments via 1476 actuators and 2772 sensors. The GLC includes complex algorithms that enable the 492 segments to act as a single mirror with nanometer precision while minimizing the effects of gravity when the telescope tracks a stellar object, temperature variations; and vibration, wind and seismic disturbances. The GLC is being developed and built by the Jet Propulsion Laboratory. The actuators, sensors, cabling, electronics and GLC are all part of the Primary Mirror Control System (M1CS). 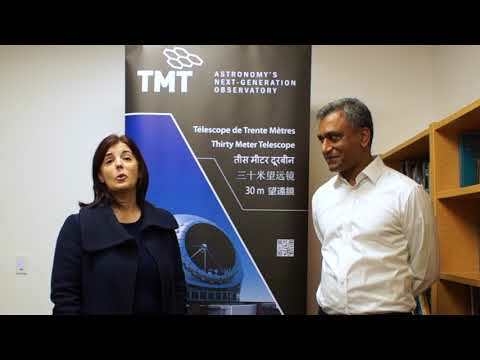 “The MSIT demonstrates the international aspect of TMT with contributions from Japan, India and the U.S.,” says Mark Sirota, manager of the Telescope Controls Group. “Tests will be carefully incremented as mirror segments are installed. The full scope of form, fit, and functionality will be verified. Initially we will start with a single segment to confirm the mechanical interfaces between SSA and the MCP. As we begin to install more segments we will continue to focus on mechanical interfaces and over time start to exercise the control aspects of the M1CS. The process will be very systematic, building up capability with time.